One of the benefits of the Internet is discoverability. Thanks to the tools of the web, we can find new and obscure. But, even if we loathe its existence at times, advertising is the original tool of discoverability. Microsoft is finally releasing a ready-for-primetime smartphone to compete with iOS and Android. However, this late in the game, it will take more than a well designed phone to win back the lost market share. What kind of decision maker are you? Do you spend hours, days, or even weeks scrutinizing every possible option? Or, do you make of lists of requirements, then make a decision once you find something that meets those requirements? What can marketers do to avoid decision paralysis? 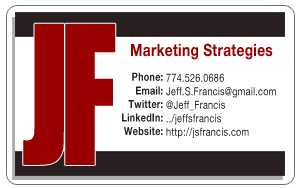 Jeff Francis is a marketing geek who would never refer to himself as a guru. He is that weird sort who enjoys watching commercials and analyzing communication strategies. He is also available for hire and would love to hear from you. So, head on over to the contact page and get in touch.